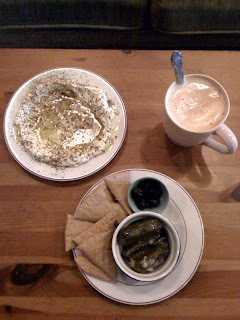 For breakfast today, I'm at Infusions Teahouse having a Spiced Chai with rice milk (sweetened with honey crystals) and the Middle Eastern Plate (wheat pita, black olives, dolmas, seasoned spread). I'm catching up on emails and trying to sort photos for posting online. I'm having a strange problem with my outgoing mail servers from my notebook computer using wireless. I'm clearly able to get online to view the Internet, and I'm able to receive emails, however, my SMTP servers won't allow me to send. To clarify, in the swing photo (below), I was just taking a break on the swing after my run. This trip has allowed me some quiet and peaceful moments to reflect and look back as well as look forward. Yesterday while running, I saw a woman in the bushes and brush gathering and eating berries from bushes. She was dressed in very natural clothing, had no makeup on, and her hair was in dreadlocks. It was kind of like seeing someone in another country going about their daily routine of gathering food. There were other women doing the same, and also families gathering food. Today, as I'm working on updating my blog and trying to organize photos, there is a woman breast feeding her baby across the table from me (another woman with natural clothing and dreadlocks). I know that breast feeding in public happens in some places, although our society is fairly uptight about it. Obviously, out of courtesy and to respect her privacy, I wasn't staring at her. She wasn't using a cloth to cover herself, so this is another impression during my trip that makes me feel like I'm in another country -- some kind of tribal village place where people are more connected to the earth and nature. When I went running this morning, once I arrived at the park, I started and returned to the National Peace Site located in the park. There is a labyrinth at the Peace Site with a tree in the center.